This is the final swap that I made. I just love it. This is a new stamp set that will be in the new Catalog, Monday. It is a hostess only set. 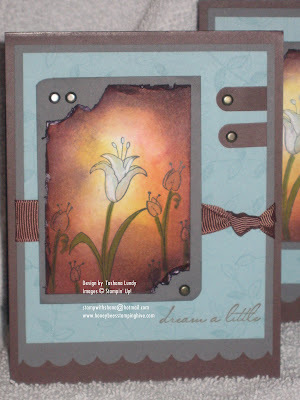 This stamp set; Dream A Little, is super pretty. I was inspired by a picture on my kitchen wall. I hope you like it. Products used....Chocolate Chip, Basic Gray, Whisper White, and Baja Breeze card stock. Corner Rounder, Word Window and Scallop Edge punches. Vintage Brads, Chocolate Chip Grosgrain ribbon, and paper piercing tool. Summer Sun, More Mustard, Ruby Red, Bravo Burgundy, and Elegand Eggplant Classic Ink. VersaMark ink pad, Black StazOn ink pad, Old Olive, Close to Cocoa, Almost Amethyst, and Bashful Blue Stampin' Write Markers. White Gel pen, sponges, and the Cutter Kit. Wow this is a great card. I just love the colors you used they blend so nice.